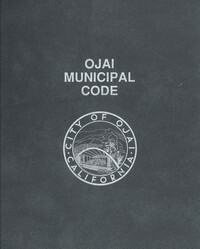 OJAI’S MUNICIPAL CODE is a codification of the general ordinances of the City of Ojai. It is unlawful for any person to violate any provision, or fail to comply with any requirements of the Municipal Code. Ojai’s citizens can access the using the link below to access Ojai’s Municipal Codes.